If you're looking for a brief review of how the cerebellum affects cognition, this article from 2004 looks like a gentle introduction. Anyway, thanks to Alex Troster for mentioning Schmahmann's CCAS. 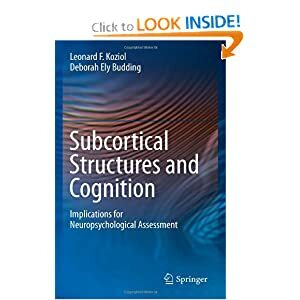 The syndrome seems to describe a patient I've seen recently, and while it doesn't clarify the diagnosis, as many diseases can affect the cerebellum, it does help make sense of the odd neuropsychological profile. And inspires me to expand the horizons of my neuroknowledge rather than indulging in fiction in the holidays (lucky I finished the final book of the Inheritance cycle a few weeks ago). Wishing everyone a peaceful and happy festive season, whether you're in Australia, north America, Singapore, Lithuania, Russia, New Zealand, or anywhere else on this beautiful and amazing planet of ours.